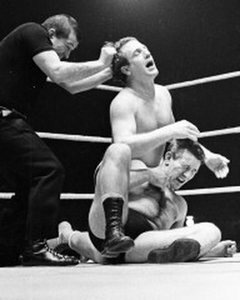 Last November heralded the passing of a true wrestling icon from the 50's and 60's . BOBBY STEELE was the epitome of a Professional mat man, from his American upright brush cut hair style to his wiry but muscular frame. This Northern lad was bred in the tough part of Salford where so many Legends have started their careers and Bob was no exception. He could wrestle with the best and enjoyed many great bouts against pistol men and ace shooters such as JACK DEMPSEY, TOMMY MANN, CLIFF BELSHAW, TED HANNON, CHIC PURVEY to name but a few. The depth and richness of talent of British wrestling in the 1960s made it difficult for a wrestler to stand out amongst the crowd, especially if he failed to wear a colourful costume, dye his hair or adopt some other outrageous gimmick. Salford's Bob Steele did stand out, and he did so simply by relying on an outstanding level of technical ability. He was singled out by middleweight champion Tommy Mann as the best of the early 1960s newcomers and biggest threat to his title. 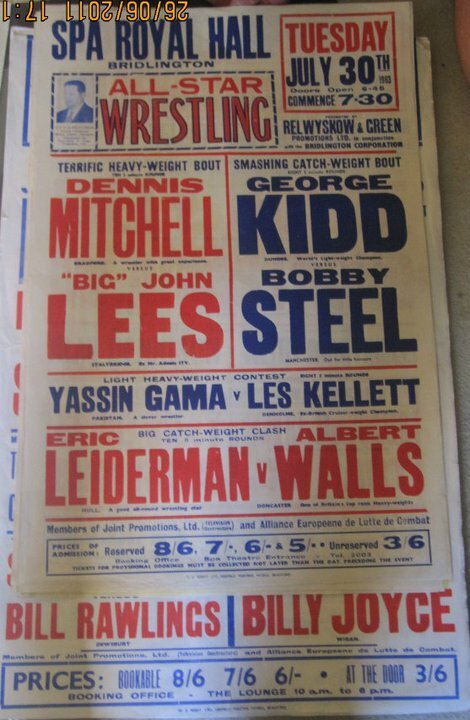 Born in 1931 Bob became interested in wrestling whilst a child and attended his first show at the Ardwick Stadium when he was eleven years old. Manchester's second stadium, “The bloodtub,” was known for fights that were just that bit more exciting and violent than at the nearby Belle Vue, and the frenzy inside the hall hooked the youngster. A couple of years later he joined the Manchester YMCA, initially to box, but soon turned his attention to wrestling. 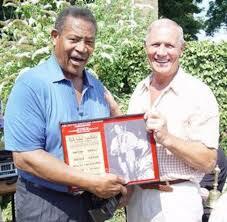 When Bobby was called upon to complete his National Service he became friends with wrestler Tony Vallon. 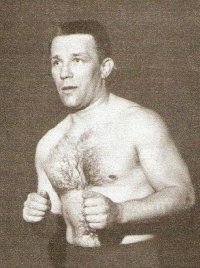 It was Vallon who encouraged the Salford youngster to put his wrestling knowledge to good use by turning Professional, which he did in 1951. Right from the start it was apparent that here was a wrestler with exceptional ability and Bobby was soon matched with the big names like Danny Flynn, Cliff Beaumont and Tommy Pye. Wins over welterweight champion Jack Dempsey were rewarded with a Championship clash but Steele was unable to beat the champion in any title bouts. He remained a highly respected campaigner on the periphery of championship honours for the best part of two decades. During the hey day of TV wrestling he was a regular feature and often took on immortals like INCA PERUANO, and MONTY SWANN that was screened in 1960. By 1967 the bumps and the grind of the wrestling ring were getting the best of Bob and he took over management of a garage in Manchester. The former car dealer in Manchester and mentor to the legendary COLIN 'BULLDOG' JOYNSON , kept up his training and catch skills throughout his life. Colin says that he pound for pound the best middleweight wrestler in the U.K., a sentiment echoed by many of his peers.Without Bob's teaching, the great Joynson would not have achieved the amazing success that he did and is the first to admit that fact. Sadly, Bob was resident in a care home for the last 8/9 years of his life and passed away quietly last Autumn. No one was informed from the wrestling world and it was only by accident that Colin visited the great man's home that he was then informed of his sad demise. The great warrior has now passed into the 'Dressing Room in the Sky' and has taken his place with all the other immortals for all eternity. Colin Joynson will pay tribute to his friend and mentor at this year's 2013 Reunion.